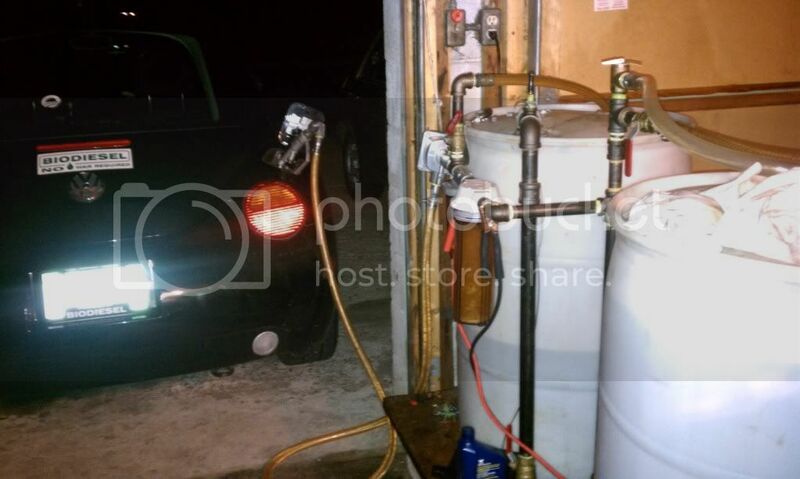 Sponsors Biodiesel and SVO Forums Home Forums Straight Vegetable Oil (SVO) as fuel General SVO Discussion Post your Fuel Dispensing Setup! Post your Fuel Dispensing Setup! I am interested in everyone's Fuel Dispensing setup's. I want to see what everyone else has to fill their vehicles so I can build a new setup for myself. If you don't have a picture, just post telling us what parts and/or items you use. Here's my set up. 55 gallon drum with pump and meter (cheap ebay item, meter is now gone due to it not being even close to being accurate), 10 micron junk filter into a Cim tek 2 micron filter. Sorry about that. Here'e the filter set up. A bucket and a funnel? Sock drains into bucket, bucket poured into funnel. I like this guys set up. Check out his pump at 3:40 min. I used to run clean oil straight from the centrifuge into a cleaned poly barrel. Then when I needed to fill the tank, I just used an air pump -- the $60 kind that lightly pressurizes the barrel and forces the oil up the pickup tube and through a hose into the tank. Barrels were free disposals from the local car wash, and were easily cleaned and reusable. Already had a compressor in the garage to run the pump, and it was sure easier and faster than the old hand crank pump! 30 gal HDPE barrel(s) are used for fuel blending and storage. A 2" male cam lock is screwed into the barrel, and the pump has a 2" female cam lock. This makes it easy to move the pump/filter assembly between fuel barrels. Thank you John Galt for the simplest trouble free design that I have been using for the last 5 years and a few thousand gallons. Fuel comes out perfect all the time with very little maintenance. It's worked for me for about the same time. I wanted something that was simple, easy, low maintenance, and didn't need electricity. The design came about from seeing what other forum members were using, and combining the best ideas I could find. Clean fuel is pumped directly into the vehicle tank. The barrels of fuel mix are stored outside. The 'summer fuel' BD & VO from fats and PHO settle out in cold temperatures and the cold filtering ensures they don't get in the vehicle tank. 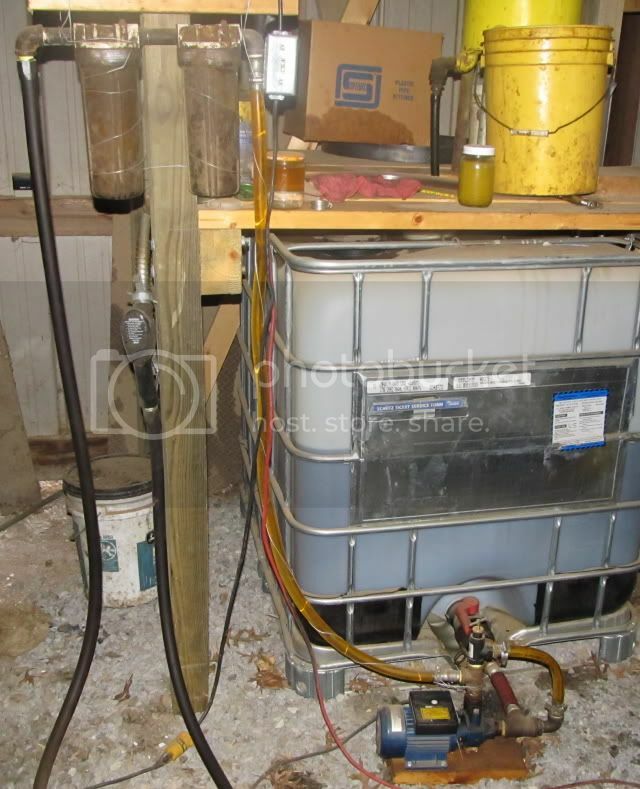 The mix in the barrel is adjusted with solvents to keep pumping pressures below 25PSI. That ensures the fuel is thin enough for the vehicle's fuel system. Simple, cost effective, and 'self regulating' in cold temperatures. Thank you guys for all of the great posts! I love this forum! I pre filter from cubby thru a 200u barrel screen, when full, heat and settle, when ready, I reheat, filter to 5u thru an X100 filter into 3 clean 55s for storage. I hand pump it into 5 gal gal cans and use a small 12v bilge pump to transfer to my onboard oil tank as needed. No pouring, less spilling. 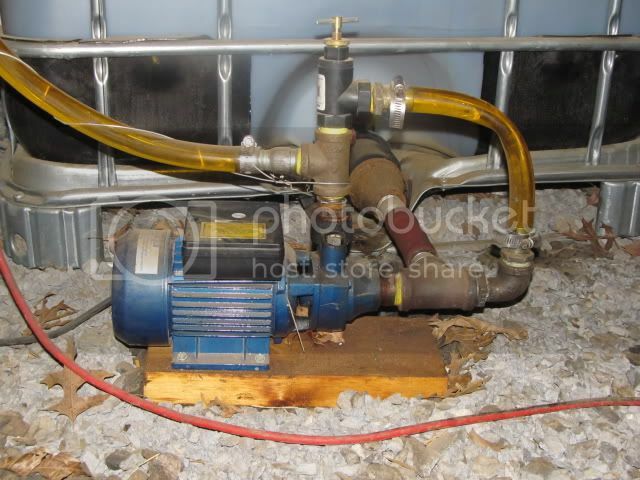 My pump is the crank type and I use a whole-house water filter, but the principle is the same. The cam-lock fittings make pump transfer easy as pie. Quick Reply to: Post your Fuel Dispensing Setup!